Los Angeles, CA, March 6, 2017 — Intellect, a leader in Enterprise SaaS software providing Business Process Management (BPM) and Quality Management Systems (QMS) solutions, today announced Intellect QMS, a comprehensive product suite consisting of nine highly flexible and configurable QMS applications leveraging Intellect's award winning BPM platform and industry best practices in quality, compliance and risk management. Los Angeles, CA, March 1, 2016 — Intellect, a leader in Cloud Business Process Management (BPM) software for Smart Enterprise Apps, today announced that Intellect Innovate 2016, the company’s annual training event and Configurathon, will take place on June 1-3, 2016 in Los Angeles at the Marina del Rey Marriott Hotel. Los Angeles, CA, February 11, 2016 — Intellect, a leader in Cloud Business Process Management (BPM) software for Smart Enterprise Apps, today announced that it has achieved approximately 50% year-over-year growth of its cloud-based BPM and workflow software for the year ended December 31, 2015. The company’s growth was fueled by the adoption of its Intellect 8 BPM Platform, an enterprise software solution known for speed, agility, and the industry’s most rapid ROI. Los Angeles, CA, May 18, 2015 — Intellect, a leader in SaaS Business Process Management (BPM) software for Smart Enterprise Apps, announced record revenues in Q1 2015, with bookings increasing more than 300% in Q1 2015 compared Q1 in 2014. The company’s new app-centric Intellect 8 BPM Platform empowers everyone to innovate by giving users the ability to create, launch, and manage an entire library of Smart Enterprise Apps ranging from simple to highly complex, mission-critical apps, without the need for programming, from design to launch. Los Angeles, CA, March 25, 2015 — Interneer, Inc., a leader in Business Process Management (BPM) software for Smart Enterprise Apps, announced its decision to rename the company under the new corporate brand Intellect at the company's 4th annual user conference, Intellect Innovate 2015. The name change to match its flagship product name, sets the foundation for the company's branding efforts to be more aligned with the company's value proposition of bringing intelligence, insight, and agility to enterprise operations for improved productivity, efficiency, compliance and engagement. Los Angeles, CA, September 17, 2014 — Interneer, Inc., a leader in Business Process Management (BPM) software for process automation applications and Smart Mobile Apps today announced that for the second year in a row, Romeo Elias, President and CEO of Interneer, was named a Top 50 Midmarket IT Vendor Executive at the 2014 Midsized Enterprise Summit (MES) and the company was nominated for six additional award categories. Los Angeles, CA, September 3, 2014 — Interneer, Inc., a leader in Business Process Management (BPM) software for process automation applications and Smart Mobile Apps today announced that Interneer Intellect MobileApps was named a KMWorld 2014 Trend-Setting Product for its contribution towards mobilizing the enterprise. Mobile apps are radically changing the business landscape – dramatically improving the productivity, efficiency, and compliance of employees in the field. Los Angeles, CA, August 26, 2014 — process automation applications and Smart Mobile Apps today announced that Interneer Innovate 2015 will be held at the Bellagio Hotel and Casino in Las Vegas on March 9-10, 2015. Interneer Innovate 2015 will bring together customers and partners from around the world to learn from BPM industry visionaries, customer success stories, partner solutions, breakout sessions, and about exciting product announcements from Interneer. Los Angeles, CA, May 15, 2014 — Interneer, Inc., a leader in Business Process Management (BPM) software for process automation applications and Smart Mobile Apps today announced the release of an updated Intellect MobileApps supporting offline capabilities for "Smart Mobile Apps" built on Interneer Intellect and deployed as a native enterprise mobile app on any iOS mobile device. This new feature enables organizations to significantly improve the productivity of mobile workers in the field with the need to enter enterprise data and capture photos while on the go, with or without internet connectivity. Los Angeles, CA, May 6, 2014 — Interneer, Inc., a leader in Business Process Management (BPM) software for process automation applications and Smart Mobile Apps announced today the company's selection as a finalist for Red Herring's Top 100 North America award, a prestigious list honoring the year’s most promising private technology ventures from the North American business region. Los Angeles, CA, April 14, 2014 — Interneer, Inc., a leader in Business Process Management (BPM) software for process automation applications and Smart Mobile Apps, today announced that it was awarded the Best Midmarket Strategy award at the [BE] Midmarket CIO Forum, held April 6-8, in Ponte Vedra Beach, Florida. CIOs and executives attending the event selected Interneer among 50 technology vendors showcasing their products and solutions at the event. The award recognizes Interneer as the company with the best strategic approach towards partnering with midmarket organizations through product development, innovation and marketing techniques. Los Angeles, CA, March 03, 2014 — Interneer, Inc., a leader in Business Process Management (BPM) software for process automation applications and Smart Mobile Apps, today announced that it has been named to the 14th annual KMWorld Magazine list of 100 Companies That Matter in Knowledge Management. The Interneer Intellect BPM platform was recognized for enabling organizations to easily and quickly build new generation business apps with robust mobile enterprise capabilities. Los Angeles, CA, December 18, 2013 — Interneer, Inc., a leader in Business Process Management (BPM) software for process automation applications and Smart Mobile Apps, today announced its 3rd annual conference, Innovate 2014, will focus on Smart Mobile Apps for the enterprise and that registration is open to customers, partners, and others interested in learning about the next wave of technology, enterprise mobile apps. Innovate 2014 will be held in Santa Monica, in the heart of Silicon Beach and near the Interneer corporate headquarters, on March 17-18, 2014. Los Angeles, CA, December 12, 2013 — Interneer, Inc., a leading provider of Business Process Management (BPM) software for process automation applications and Smart Mobile Apps, today announced that it won the "Most Innovative Mobile Solution" award at the Enterprise Mobility Forum. Interneer was awarded for enabling Smart Mobile Apps for the enterprise, leveraging a BPM platform that requires no programming and instead uses a drag-and-drop interface designed for business users and IT departments, offering enterprise-level security and integration to back end data and enterprise applications. Interneer was selected by CIOs and Mobility Executives attending the event on December 8-10 held at the Phoenician in Scottsdale, Arizona. Interneer, Inc. a leading provider of Business Process Management (BPM) software for process automation applications and "Smart Mobile Apps," today announced a new, disruptive and simplified pricing model, as well as a "free community" option for enterprise clients. To increase operational efficiency and productivity beyond the enterprise, organizations with an enterprise license can extend apps built on the Interneer Intellect BPM platform to customers, partners, suppliers and others at no additional cost – clients only pay for internal users. Organizations can create a library of apps for enterprise use starting at $45 per user per month in the cloud, and $30 per user per month on-premises; pricing for a single app starts at $15 per user per month in the cloud, and $10 per user per month on-premises. Gartner MarketScope for Business Process Management Platform as a Service (bpmPaas) Rates Interneer as Promising Software Vendor. Interneer, Inc. a leading provider of Business Process Management (BPM) software for process automation applications and Smart Mobile Apps, today announced that the company was recognized as a "Promising" software provider among 14 vendors by Gartner in its "MarketScope for Business Process Management Platform as a Service" report November 15, 2013 by Michele Cantara, Teresa Jones, Kimihiko Iijima. Interneer offers rapid, "No Programing" development environment that automates structured and repeatable processes by business users; makes it easy for organizations to extend apps to mobile devices; and the company’s new, "Free Community" option that enables enterprise clients to extend apps to customers, partners, suppliers and others at no additional cost. Interneer, Inc. a leading provider of Business Process Management (BPM) software for process automation applications today announced Intellect MobileApps that enables business users and IT to easily build and manage native "Smart Mobile Apps" on any iOS device for enterprise use. Smart Mobile Apps are integrated with back-end systems and enterprise applications, deliver enterprise level security with Bring-Your-Own-Device (BYOD) capabilities. Designed specifically for midsized companies and departments of large enterprises, Smart Mobile Apps improve the productivity and efficiency of employees in the field, and customers, partners, suppliers and others who need access to vital enterprise data on the go. Interneer, Inc. a leading provider of Business Process Management (BPM) software for process automation applications and Smart Mobile Apps today announced that it was named a "KMWorld Award" finalist at KMWorld 2013. Interneer was recognized for the company's market leading Intellect BPM and MobileApps software platform, designed to empower business users with a drag and drop environment that requires "no programming" to generate Smart Mobile Apps. 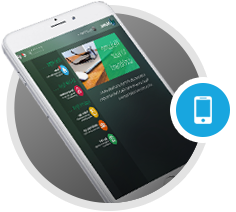 Interneer's Smart Mobile Apps are available on any device, anytime, anywhere, and ideal for business apps that require workflow automation, enterprise level security, data integration, privacy, and high reliability. Interneer Selected by CIOs of Midsized Companies, IT Executives and Technology Analysts. Los Angeles, CA, October 30, 2013 - a Interneer, Inc., a leading provider of Business Process Management (BPM) software for process automation applications and Smart Mobile Apps, today announced that it was selected as a finalist award winner for "Best Emerging Midmarket Solution" at the Midmarket CIO Forum. Interneer was one of four companies selected out of 55 vendors by CIOs, IT Executives, and Technology Analysts attending the event October 27-29 at the JW Marriott Starr Pass and Resort in Tucson, Arizona. Interneer, Inc. a leading provider of Business Process Management (BPM) software for process automation applications and Smart Mobile Apps, today announced that CEO Romeo Elias has been named to the Top 50 Midmarket IT Vendor Executive list featuring the industry’s most influential vendor executives who serve midmarket and midsize customers. Akash Energy, a provider of sustainable fuels, including biodiesel, ethanol, and traditional petroleum based products, selected Interneer Intellect BPM in the cloud to automate numerous business processes and to help streamline operations. Mr. Hargittay will be responsible for all marketing and business development functions on a global basis. Interneer was recognized for its intuitive usability, robust architecture, product strategy, channel strength, and long-term viability. Interneer's new BPM platform Interneer Intellect 7 was highlighted as one of the easiest-to-implement web-based BPM platforms, enabling a new generation of process automation applications and smart mobile apps for better, faster and streamlined business processes. Interneer Intellect 7, which provides rapid, no-coding development with real-time reporting and dashboard applications, adds more than 50 feature enhancements to the product since its 6.5 update in April 2010. In addition to its Intellect 7 upgrade, the company also released Intellect MobileApps for iPad. Interneer sees substantial channel revenues, with over half of total revenue generated by partners, resellers and VARs. New customers include Emerson Climate Technologies, Los Angeles Firemen's Credit Union, and Georgia State University.